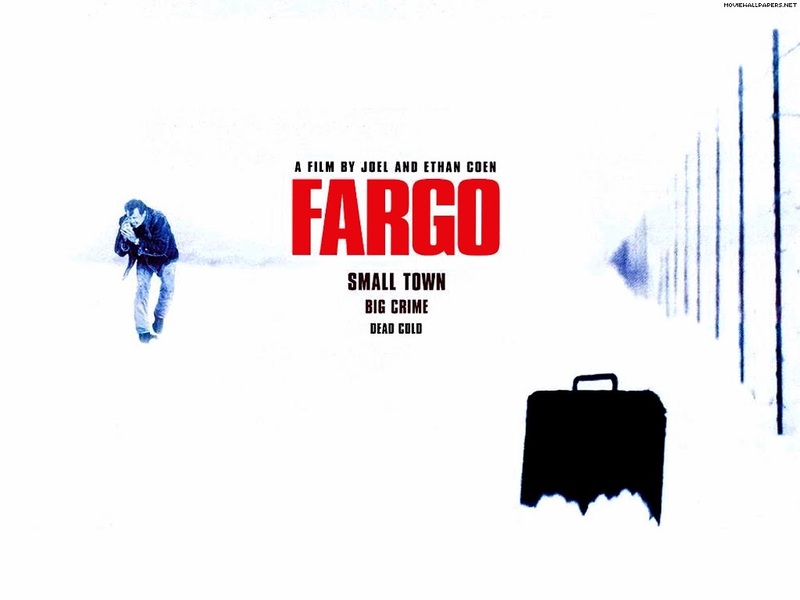 Joel and Ethan Coen’s Fargo opens, appropriately, in Fargo, North Dakota, although this is the only scene in the movie to actually take place in the title location. Over the opening credits we see a car, barely visible through the fog in the distance as it makes its slow progression through the snowy, bluish gray landscape. The tan Sierra goes up and down on the frozen-over roads, occasionally disappearing into snowy voids. The Coens’ Midwest is bleak and ominous, a mood perfectly underlined by Carter Burwell’s gloomy score. The brothers and virtuoso director of photography and long-time collaborator Roger Deakins create an epic landscape of near mythical proportions, if only for the purpose of contrasting it with the ordinariness and decidedly unheroic nature of the characters that inhabit it. Contradictions like this one abound in the Coens’ universe; their work has always defied definition. They play fast and loose in terms of plot and refuse to be constrained by the formal imperatives of conventional narrative, stitching together a number of different genres and in the end transcending such conventions altogether. 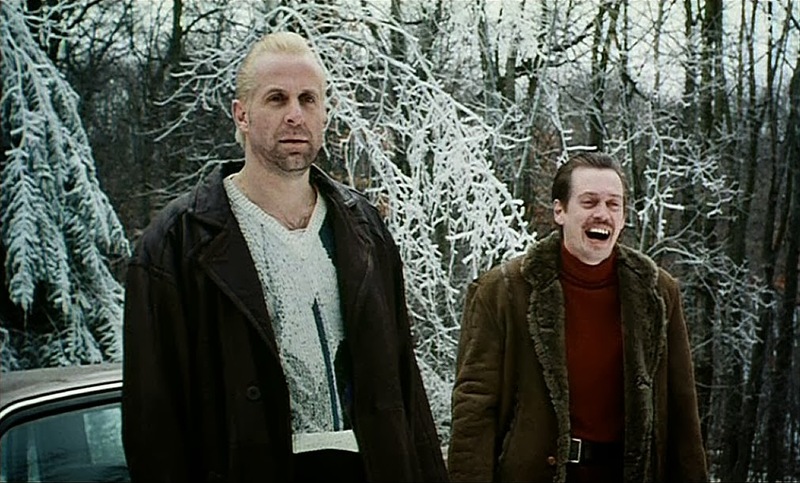 Fargo starts out as a perfect-crime drama, but soon embraces conventions of the noir, the thriller, and tragedy, all with a big, darkly humorous smile on its lips. 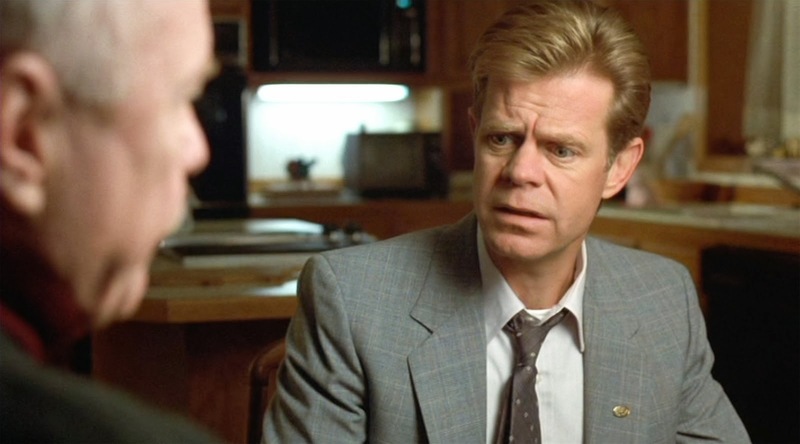 Jerry Lundegaard (William H. Macy) is the epitome of the prosaic, petty individual drawn into a dark underworld of crime that he is incapable of understanding or controlling. He is weak and incompetent, and what must be the least persuasive car dealer to have ever lived. He struggles through all his conversations at home and at work, barely able to get a word in edgewise, and whenever he does, he seems to be answering a question posed a few minutes before but whose response had been caught in his throat for the interim. Past the point of no return, he tries to solve his financial situation by having his wife kidnaped and splitting the ransom money with the perpetrators, a plan he fumbles himself into with no comprehension of its complexity. As the crime goes awry, he tries as best he can to salvage the situation, only managing to get himself in deeper. He is so bad at organizing a kidnapping that when he wants to call it off, he doesn’t have any way to get in contact with the kidnappers. His tale is one of failure, betrayal, and frustration. 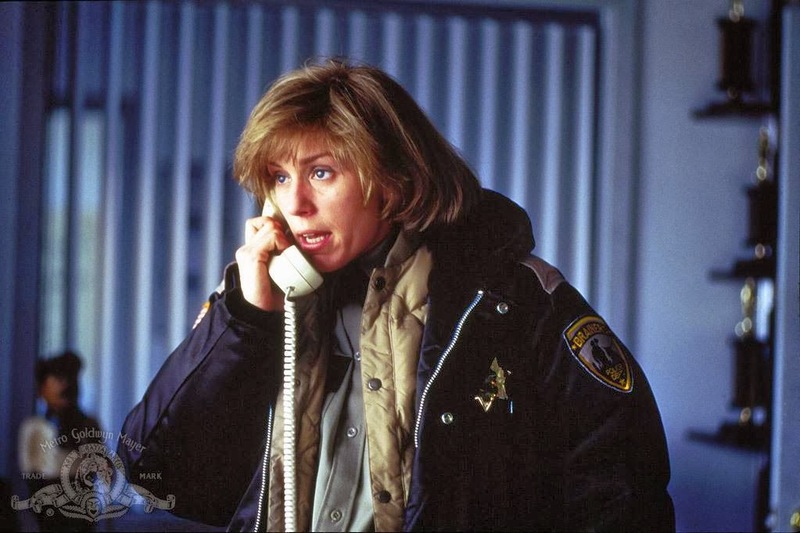 Marge’s (Frances McDormand) high school friend Steve Park (Mike Yanagita) is an exaggeration of the main character; he, too, is desperate and lonely and lies compulsively to others and himself in an unsuccessful attempt to prove he is neither. Like the Coen brother’s Dude in The Big Lebowski, but to a lesser extent, Jerry embodies the Jewish folk character of the ‘schlemiel’—the clumsy, inept, charismatic character that stumbles from one situation to the next, pushed around by circumstances that are not of his own making. In his final scene, when he is arrested in a generic hideout motel, he fights and squirms childishly like a kid midway through an almighty tantrum thrown because he is unable to understand what he did wrong. The criminals are not any better at getting the job done quickly and efficiently. 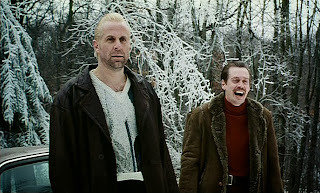 A pair of misfits, the loquacious, “kinda funny-looking” Carl (Steve Buscemi) and the laconic, chain-smoking Gaer (Pater Stormare) don’t have the slightest idea what they’ve gotten themselves into. 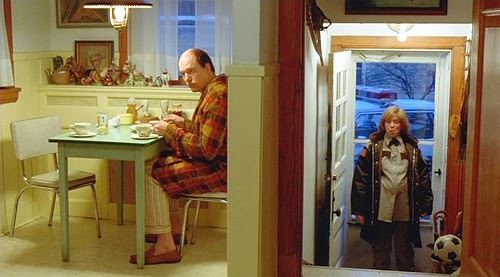 As in Tarantino’s Reservoir Dogs, the criminals are deglamorized through their behavior and the triviality of their dialogue, such as when Gaer expresses his preference for pancakes in no uncertain terms, or, in keeping with the oddball tone of the film, one of the few words he does speak, and actually repeats, is “unguent.” The Coen brothers, like Tarantino, blend violence with comedy in unpredictable ways, making for a darkly funny flattening of affect, as when Marge’s only response to a call about a triple homicide is “aw, geez… aw… It’s a real shame.” At other times, the violence is so sudden and bloody, it’s almost cartoonish. I can’t quite explain why the image of someone’s leg sticking out of a wood chipper makes me laugh, but I think it’s hilarious. The mood is conveyed throughout the movie through the brilliant lighting and Deakins’ cinematography. His color palette is starkly beautiful as he contrasts the strict white-gray exteriors with the warm colorful interiors, most strikingly in the scene when Marge is about to leave her house for the first time: the frame is divided roughly down the middle, with Norm on the left side at the kitchen table, bathed in a snug green, and Marge walking outside into the cold blue dawn. Borrowing from noir, Deakins shoots the scene of Gaer killing the witnesses from a slanted low angle shot at ground level, with the taillights of the upturned car casting their blood-red light on the snow as one of the victims runs off into the dark background. The style of Fargo, however, never overpowers the characters, which provide the focus and drive of the film. They are all flawed individuals, and the Coen brothers remind us that ordinary people do matter, just as Marge reminds Norm in the last scene of the movie that people need the little stamps. The writers/director take advantage of genre conventions, of character types, and viewer expectations, but in the end turn them on their head, embracing chaos and absurdity instead of tidy plot formulas. They see classic styles and themes from a new, only half-serious perspective, mixing and matching until they have a movie that is truly, uniquely theirs.